Construction work continues in Delaware Co.
Construction season continues in Delaware County with orange barrels and signs directing motorists around work zones prevalent throughout the area. The lovely orange flowers of summer continue to dot roadways throughout Ohio. It’s no different in Delaware County, where orange barrel season is in full bloom with a slew of construction projects in progress. According to the Delaware County Engineer’s Office, projects are active at numerous locations. The roundabout on Sawmill Parkway and Hyatts Road will be closed Wednesday through Friday of this week for a resurfacing project. South Section Line Road between Hyatts Road and Clark Shaw Road will be closed for resurfacing from Monday, Aug. 14 through Friday, Aug. 18. Additionally, South Section Line Road from Bunty Station Road to Bean Oller Road will be closed from Monday, Aug. 14 through Friday, Aug. 25 for resurfacing. Due to a bridge construction project, Bale Kenyon Road will be closed between Creekwood Drive and Bluff Drive. The closure will be in effect from Monday, Aug. 14 through Friday, Sept. 29. North Road between Shanahan Road and Lewis Center Road is scheduled to re-open Thursday. It has been closed since May 30 for road widening. Part of Cheshire Road will be closed until Tuesday, Aug. 15 for a construction project. The stretch of Cheshire from Tara Glen Drive to Gregory Road is closed to traffic during the road-widening project being conducted by Park Enterprise Construction. CSX Transportation is closing two railroad crossings in order to conduct resurfacing projects. The crossing on Hills-Miller Road at the junction with Troy Road will be closed Monday, Aug. 14 through Tuesday, Aug. 22. The crossing located on North Section Line Road between Penry Road and Gallant Road will also be closed from Monday, Aug. 14 through Tuesday, Aug. 22. 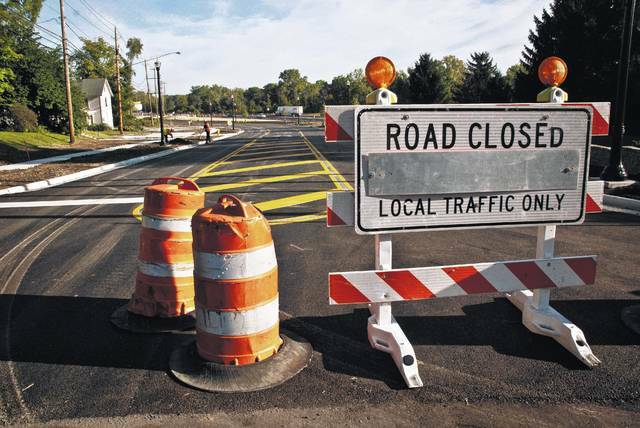 Hogback Road between State Route 521 and Howard Road is closing for road construction. The road will close on Monday, Aug. 14 and reopen on Monday, Sept. 4. Projects are also being conducted inside Delaware city limits. American Electric Power will be replacing poles and wiring Tuesday and Wednesday on River Street between midnight and 5 a.m. each day. River Street will be closed during the work and U.S. 23 access will be reduced due to lane closures. Columbia Gas has closed the intersection of Union Street and Heffner Street, between Fountain Avenue and Sandusky Street, through Monday, Aug. 14. Columbia Gas is boring under U.S. 23 in that area. A detour is posted. The Ohio Department of Transportation has multiple projects in play throughout Delaware County. Resurfacing and slope stabilization work continue along State Route 315. Both of those projects are supposed to be complete by October of this year. ODOT is resurfacing State Route 203 from State Route 37 to the Marion County line. U.S. 23 is also being resurfaced from State Route 229 to the Marion-Delaware county line. It’s supposed to be finished in September. Resurfacing work continues along State Route 37 and U.S. 36 east of Interstate 71. That work is expected to be finished in September. Culvert repair is being conducted north of Worthington-Galena Road under Interstate 71. It’s supposed to be finished in September. A portion of the Olentangy Trail under Interstate 270 will be closed through Nov. 1 to complete construction on new ramps and bridges at the I-270/State Route 315 interchange. For information about local construction projects, visit www.delawarecountyengineer.org. To see what ODOT projects are happening in Delaware County, visit www.dot.state.oh.us/districts/D06/Pages/Home.aspx.